One of the great things about road cycling, mountain biking, trail running and hiding from the authorities in the woods, is that you get to see plenty of wild "things". Pretty much every trip out I make I'll see something notable - part of the pleasure of living on the edge of the almost-countryside. These "things" are rarely important enough to mention by themselves but it's about time I wrote a little about them. There are two types around here, and I can pretty much guarantee seeing at least one of them on every ride. Sometimes they may even be alive. The most common are the Muntjac, an imported species that were brought to the country by Sir Jack Munt for his children to use instead of horses. They are the size of a large dog, and curiously "bark" as well. These are everywhere and can pose a danger to the speeding road cyclist. Whilst riding on the road at night I once had to weave through three large lumps... which revealed themselves to be the remains of an exploded muntjac. 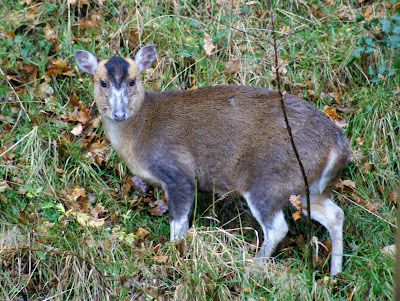 This is a muntjac in my garden. The other deer are Roe deer. These have the decency to behave a little more deer-like. They are rarer, hide in the woods more and leap away when disturbed, flashing their little white asses in the air. The teases. They're still rubbish at dodging cars though. Hedgehogs, alive and dead. Dead are more common. Rabbits, all over the place. Hares. Mainly alive. I saw one on Saturday pretty close up... big aren't they? Grey squirrels. Vermin, they keep stealing all the bird food I put out. Water voles, mainly by the canal. A dead polecat. Just one, with their existence in the area confirmed by a forest ranger. Badgers. I have seen four or five live ones, and many more dead ones. I'd hate to hit one at speed, an enraged badger would probably eat me. A weasel or two. Or maybe a stoat. Probably a weasel though. Rats and mice. Almost certainly "common" versions. That's a pretty good collection. No boar, wallabies, wildcats, otters, pine martens, monkeys or mysterious big cats. Ah... probably my favourite category, mainly due to their rareness. I have seen, in the UK, exactly two snakes. Both recently, both grass snakes, both about 18" long. One was on Greenham Common, which is also adder habitat, and the other was crossing the road about a mile from my house. Why was it crossing the road? Insert your own punchline. I've also seen exactly two slow worms. Slow worms are legless lizards. There is a difference between a legless lizard and a snake and once you've had a slow worm pointed out to you they are clearly different to snakes. They look like eels. Oh, both of the slow worms were dead. Lizards. Some. I remember not where, but I've definitely seen a lizard or two. These clearly fit into the "more dead than alive" category. At certain times of the year the back roads are strewn with crushed frogs and I've even been unfortunate to hit one or two. I see this as lack of evolution in action - they clearly haven't bred selectively enough to work out they should hop quickly across the dark grey surface rather then hopping randomly around in circles. More videogame practice needed. Toads.. well, probably. I'm not very good at the whole frog/toad disambiguation, and they look fairly similar once they've been flattened by two tonnes of motor car. No newts. I'd love to see newts. Coming soonish... part two... birds. Including live killings!